Two groups, the prosauropods and the sauropods, are included in the sauropodomorphs. 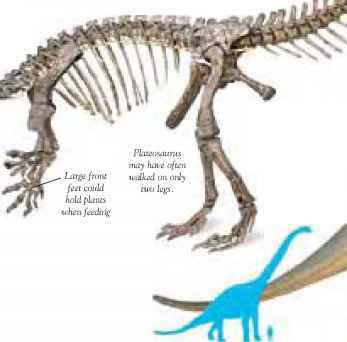 Unlike the theropods, most sauropodomorphs were quadrupedal (walked on four legs) and were herbivores. They had long necks and tails, and ranged in size from 6/2 ft (2 m) to 130 ft (40 m) in length. 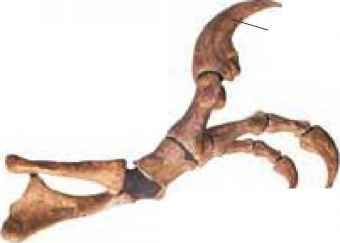 Apatosaurus thumb claw thumb claw Many sauropodomorphs had big, curved thumb claws. They probably used these dangerous weapons for defense. Prosauropods such as Plateosaurus were the first large land animals. Several complete skeletons of the prosauropod Plateosaurus have been found. It is one of the earliest and largest saurischian dinosaurs of the Triassic period. Although quadrupedal, it could probably stand on its hind legs to reach up to feed on the higher branches. 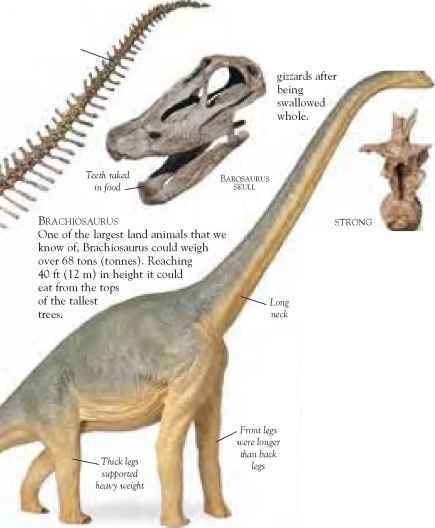 strong support Brachiosaurus' dorsal (back) vertebrae had to be extremely strong to support its enormous weight. • The name sauropodomorph means "lizard-footed forms." • The largest dinosaur was a sauropod called Seismosaurus. • All sauropodomorphs were herbivores, although some may have eaten meat as well.